Fashion Week is around the corner. Whether you’re a star-struck newbie or fashion week veteran forever RSVPing, forever jet-setting, now is the time to bring your style A game. From mastering stripes to pulling out all the stops with slit sleeves, we’ve got you covered from head to perfectly polished toes with these six trend-led pieces. 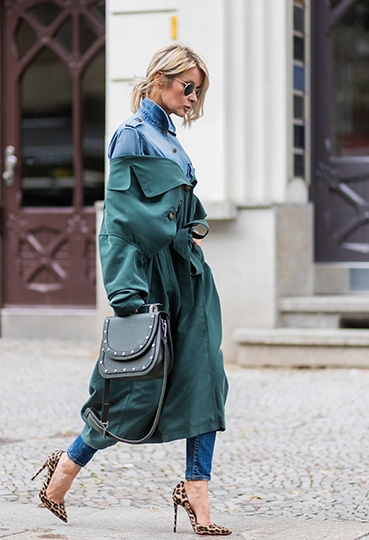 Forget the classic beige cover-up, the trench has had a chic revival. With a slouchier, more sophisticated cut, it boasts an edgier look thanks to a myriad of detailing: oversized buckles, contrast buttons, a drop-waist hem and even puff sleeves. No questions asked, just get your hands on one. Wear it: To elevate your #OOTD, whether it’s an oversized slogan jumper with relaxed striped trousers or a silk LBD, a trench coat will work. Don’t forget to add brick-red lipstick for a made-you-look finish day or night. From fluttery accents to flowing bell sleeves, the slit sleeve trend is claiming its place in the spotlight. Whether it’s cut up to the elbow or wrist or fashioned in the form of a cape, this is one trend designed to flatter. So go ahead, show some skin and win major style points while you’re at it. Wear it: Try a bold-coloured blouse – bright pink or mustard will do the trick – with long arm slits and pair it with high-waisted flared trousers for a lesson in mixing up the classics. Or for an athleisure-inspired take on the trend, try a sweatshirt with slit sleeves, and team it with a leather miniskirt and buckled trainers. From one-shoulder top to shirt dress, miniskirt to mixed pleat culottes, rainbow bright stripes have been paraded in every way imaginable on the streets as well as on the runway. Now it’s time for you to get in line, pun intended. Wear it: in the form of stretch crepe trousers with contrast block stripes at each side – the brighter, the better – paired with a lace trim shirt. Polish the look with block-heel leather boots and astudded box clutch. 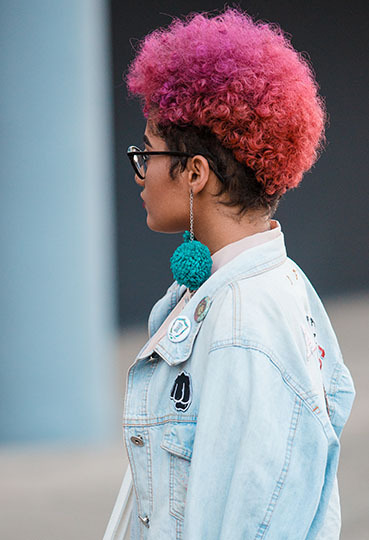 Sculptural hoops, shoulder-grazing danglers and even colour-block pom-pom pieces, whatever your liking, statement earrings are must-haves for pounding those uber chic pavements. Not to mention they will guarantee you double-takes. Wear it: with floral-print trousers, an oversized men’s shirt, your favourite sliders and a woven basket clutch to top it off. Or use neon tassel earrings to elevate an Oxford shirt or an all-black ensemble. Effortless yet oh so enticing. Fashion Week sunglasses are all about personality with a capital P. Remember this is the one place you can go OTT without feeling out of place, so we say go bold or … well, you know the drill. Wear it: old-school glam (with a twist) by choosing a bold red cat-eye style that complements your equally bold look. Or stay on-trend with a yellow-tinted pair for a sunny disposition no matter how long you’ve been on your feet, without snacks. No Fashion Week look is complete without statement shoes. And the look du jour is a backless piece. Whether it’s mules, loafers or slides, it’s time to ditch the basic heel and go all out. Though we suggest a modest heel to amp up the comfort when running from frow to frow. Wear it: with a slogan T-shirt tucked into paper bag leather trousers. And style it with an oversized military blazer and a slinky shoulder bag for a head-turning take that you can throw on in minutes. Our kind of #OOTW.